When my two favorite seasons – Grilling Season and Berry Season – combine you get grilled chicken with a berry makeover. 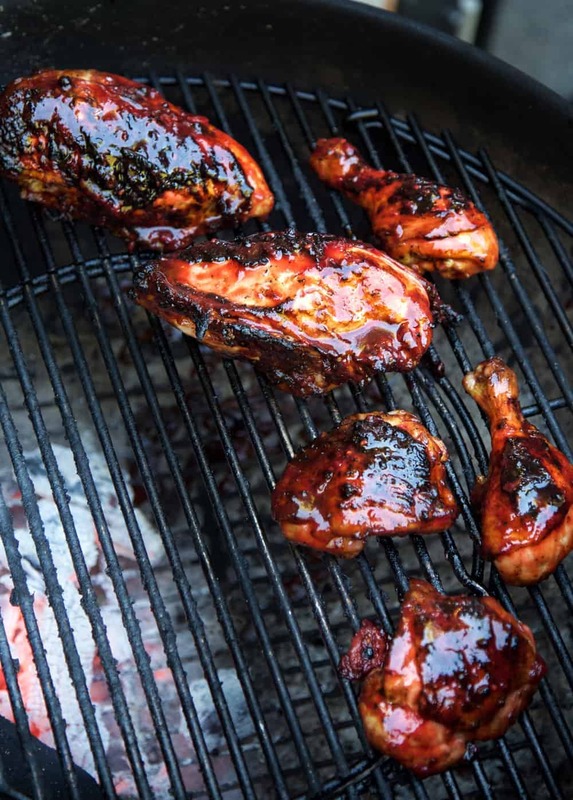 We joined AM Northwest to cook up our new recipe for Grilled Chicken with Blackberry BBQ Sauce and it was awesome! Berry season is a universal favorite in my household. 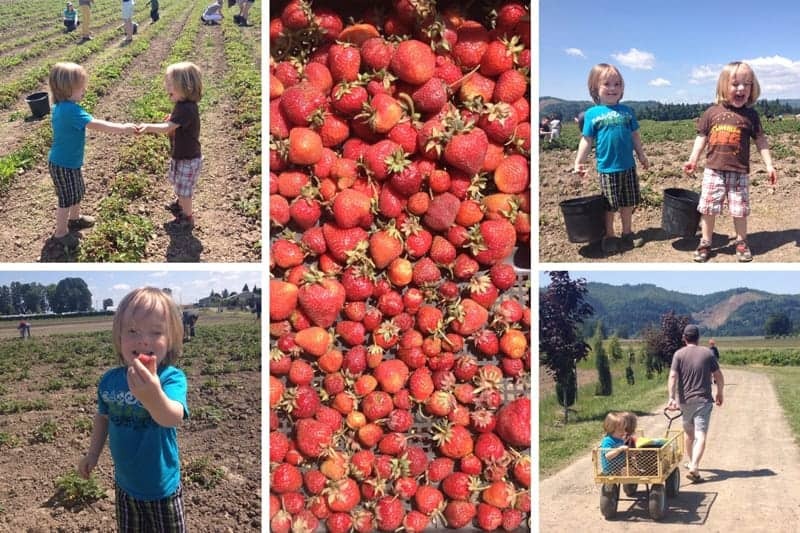 We take the kids out berry picking almost weekly this time of year. But my kids tend to go a bit overboard, picking more berries than we can eat before they start to go bad. Not being huge bakers around here, we like to experiment with berries in savory dishes and sauces, like what we have here. And using it on one of the most underappreciated proteins, this sauce is an excellent way to jazz up an otherwise boring cut of meat. We like to get a whole chicken, cut into quarters. If you don’t see this at your store your butcher should be able to cut up a whole chicken for you. Just ask! Otherwise, feel free to use the equivalent of your favorite cut of chicken. Ideally with the bone in, and skin on, to maximize flavor. First coat your chicken with olive oil then season it liberally with your favorite dry rub. We like this basic dry rub for chicken. Then set your grill for indirect cooking, like this. If you’re not sure of this technique, see this post for a detailed description. Then cook your meat. The key is to start with the chicken cooking over the direct heat to get that crust on each side, then move to the indirect side so you can slowly bring the meat up to temperature. 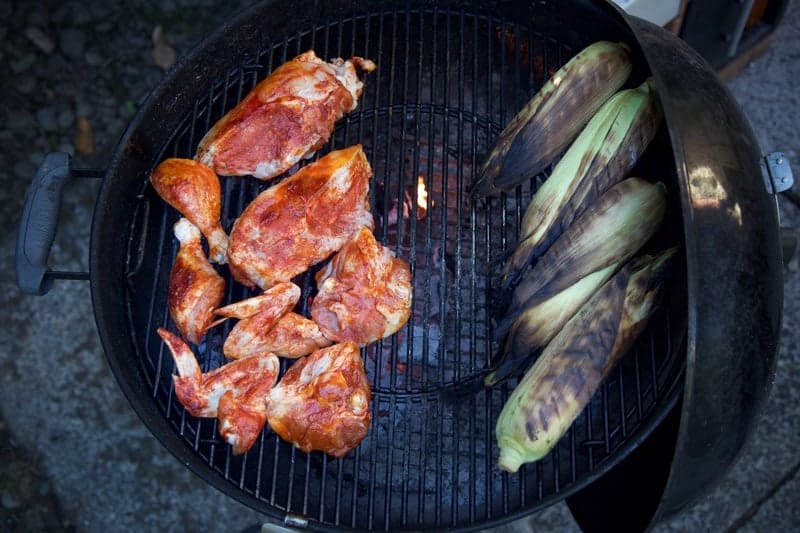 The chicken here is being cooked on direct heat, while the corn is being finished on indirect heat. What we’re doing is infusing some berries into your favorite style of BBQ sauce. You can use whatever berries you like. Right now strawberries are in peak season. So feel free to use them. Or blackberries, marionberries, blueberries, you make it the way you like it. Just know that the riper the berries the sweeter they will be. If you buy store-bought berries they tend to be less sweet and possibly less ripe. So feel free to adjust the amount of berries based on the sweetness when you taste them. For this recipe we’re using a Carolina style sauce. This is a vinegar-based sauce. It’s Sean’s favorite style, so this is our base. But if you prefer a Kansas City style, which are tomato-based, less acidic, and usually sweeter, then do that! So all we do is add our sauce ingredients into a saucepan then mix in our berries. Bring to a simmer and cook about 10-15 minutes until the berries are soft and the sauce has reduced a bit. Then you have two options. You can throw it all in the blender or food processor and mix until smooth, or just pour everything through a strainer (the blender method will make for a thicker sauce, while the strainer method will be just a touch thinner since you will have removed some of the remaining berry pulp). Once your chicken is almost at proper temperature glaze the meat. You don’t want to do this too soon otherwise you risk burning the sauce and the meat. High heat + sugar sauces = easily burned. Wait until your chicken is about 155 degrees, then glaze the meat. You can do this by dipping your pieces of chicken into the sauce, OR just brush the chicken with a food-safe paint brush. Let it finish cooking over indirect heat, which will help caramelize the sauce onto the meat, until the internal temperature of the meat is 165 degrees. Each piece of meat will finish cooking at different times. The legs and thighs will cook quicker since they are smaller, and the breast meat will take the longest, since it’s the biggest. Make sure to always use a good digital thermometer so you make sure you cook your meat to the perfect temperature and don’t overcook it (causing the dreaded dry overcooked chicken!). 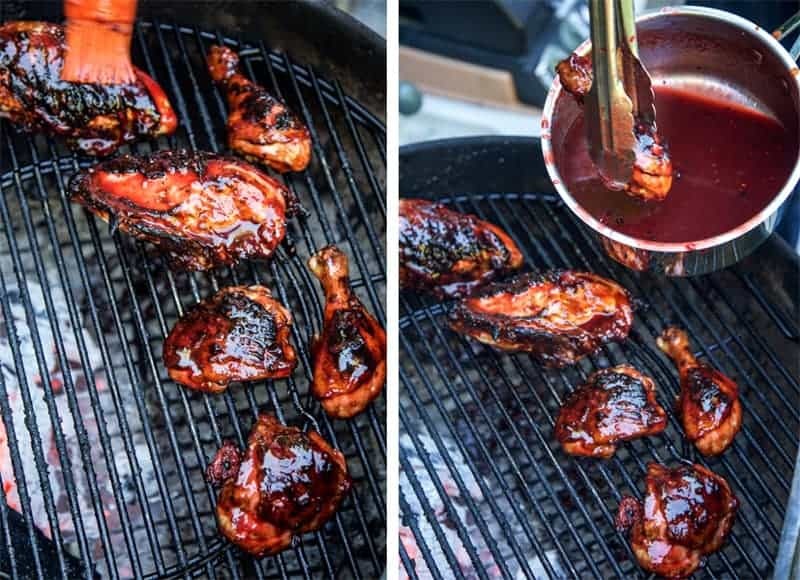 Grilled Chicken with Blackberry BBQ Sauce. A great way to use summer berries and jazz up grilled chicken. 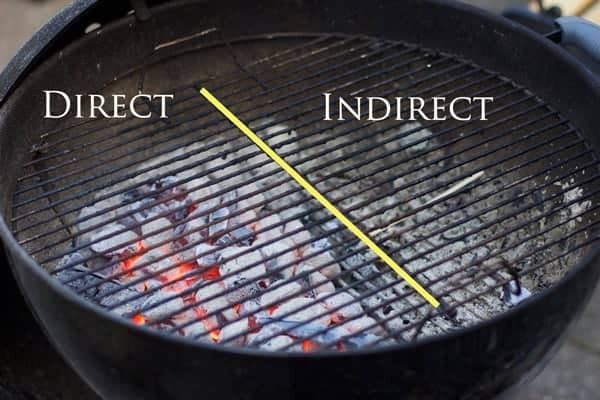 Set your grill to direct and indirect cooking. Coat chicken with olive oil and then season with your dry rub liberally. Place chicken on direct heat, paying close attention to the flame to get a nice crust, about 90 seconds and then flip. Repeat and get a nice crust on the other side of the chicken and move to the indirect side. Cover grill and monitor temperature after 10 minutes. Legs and thighs will cook faster than your breast. 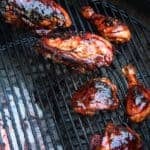 When chicken reaches 155 degrees, glaze with your sauce and then pull of grill when internal temperature is 165 degrees. Reglaze chicken and let sit for at least 5 minutes to let the juices redistribute and then enjoy!!! In a medium saucepan add all ingredients and bring to a simmer. Simmer for 10-15 minutes, stirring often, until the sauce has reduced a bit and the berries have softened. Using a potato masher or fork, break up the berries. Transfer to a food processor or blender to make smooth, or pour the sauce through a strainer. Serve with the grilled chicken. With the hot sauce in the BBQ sauce: if your hot sauce is really spicy add it 1 tablespoon at a time. We like Valentina hot sauce, which isn’t too spicy. Just know that the spicier the hot sauce the spicier the resulting BBQ sauce will be. So start small. To see us cooking this up on AM Northwest click below. If this doesn’t plan click here to be taken to the AM Northwest site to view it there.